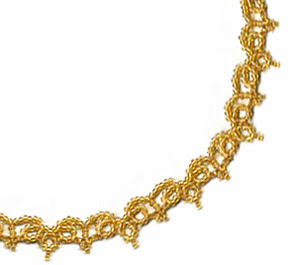 The Easy Picot Necklace pattern has little beaded picots to add dimension to the lacy look of the necklace. 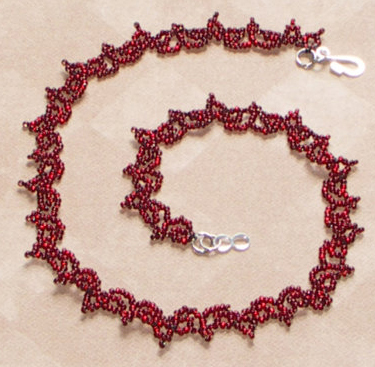 This necklace introduces you to how easy it is to add picots to any pattern you are working on. 1. Pick up 10A, go with thread forward through the 1st through 6th A beads just added. 2. Pick up 1A, go with thread forward through the 6th through 10th & 1st A beads added in step #1. 3. a) Pick up 11A, go with thread forward through the 2nd through 7th A beads just added in this step. b) Pick up 1A, go with thread forward through the 7th through 10th A beads just added in this step, down through the 3rd A bead, step #1 (first time) or the 9th A bead added in step #7 (every time after) and forward through the 10th, 11th & 1st A beads just added in this step. 4. a) Pick up 11A, go with thread forward through the 2nd through 7th A beads just added in this step. b) Pick up 1A, go with thread forward through the 7th through 10th A beads just added in this step, down through the 4th A bead, step #3 and forward through the 10th, 11th & 1st A beads just added in this step. 5. a) Pick up 10A, go with thread up through the A bead added in step #4(b) and down through the 10th A bead just added in this step. b) Pick up 1A, go with thread down through the 10th A bead added in this step at (a). 6. Pick up 3A, go with thread up through the 10th, 9th, 8th & 7th A beads added in step #5a. 7. Pick up 16A, go with thread forward through the 7th through 12th A beads just added in this step, down through the A bead, step #5b, and forward through the 7th through 11th & 1st A beads just added in this step. 8. Repeat steps #3 and #4. 9. Continue necklace by repeating steps #5 through #8 until you reach the length that you want your necklace to be. 10. With working thread weave through necklace, coming out with thread down through the A bead added in step #4 repeat. To add clasp, pick up 3A, clasp, 3A, go with thread up through 1 A bead (picot bead) in necklace. Continue with working thread around through the clasp beads several times. Weave the working thread into the necklace and end. Repeat the clasp directions in the same manner on the other end after removing the stopper bead. 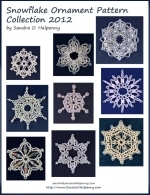 I made this Snowflake Ornament video a couple of years ago for fun. Enjoy! These basic directions can be used for just about any necklace pattern. 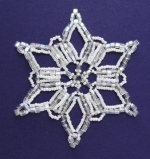 Once the middle part is complete, made from the necklace pattern, the rest is up to you what you want to add. The beads used to attach the top ring to the middle section can be any variety of beads you would like to use. You can also decide to add fringe or leave the bottom edge plain. You could add drops of large crystals too. 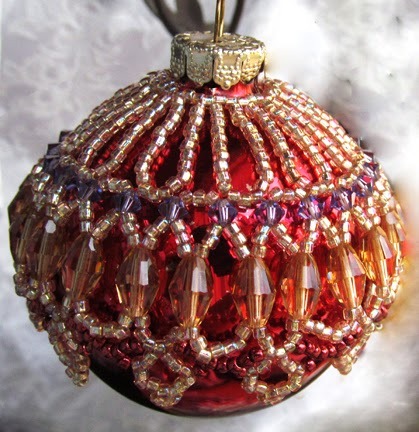 Use your imagination to create your ornament. You might need to experiment with different beads but since the middle is made from the necklace pattern the rest is easy. Start by making the necklace as the pattern directs. 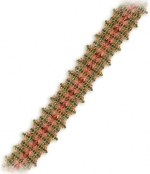 You will want to use a necklace pattern that has Units of repeats. Of course do not add any closures. When you just about reach the size that you want, you then need to work on joining the 2 end pieces together. Whatever necklace pattern you are using, look at the front center of the finished piece to match the section you are missing. Join the 2 ends by working the missing section by following your pattern. After completing the second row, join that row. You need to have an even number of repeats because the repeat Unit in Row 2 is 2 sections. So I did the pattern with 23 loops and the 24th loop was the joining loop. 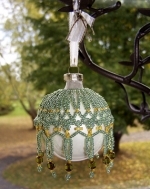 As you are working on the necklace pattern piece, place it around the ornament to check for size. 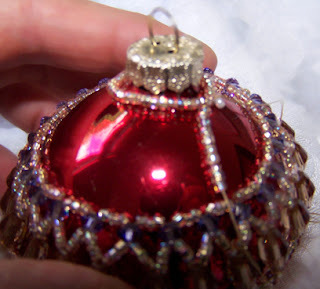 This is also when you decide where on the ornament that you want the piece to lay. The ring of the necklace pattern has 24 sets of 3 beads at the top. 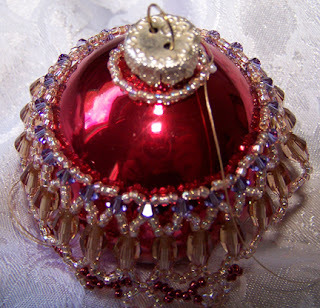 Also make a ring of beads to fit the top of the ornament. Go with working thread around through the ring of beads twice and that way the ring doesn’t come loose while you are working on it. The count doesn’t matter but should be an even number. On my sample thee top ring around the neck of the ornament has 36 beads. The number of beads around the neck of the ornament is determined by your ornament. So now we need to figure out how many times to go down to the necklace pattern ring with beads from the neck ring beads. I do not want to go into every 3 bead spaces of 24, so I divide the necklace pattern ring by half. So now we have 12 sets of 3 beads. Going up to 36 beads. So to get an even number of beads lines we are going to go through 1 bead in the top ring and then skip over 2 beads (=3 beads), all around and go into every other bead. 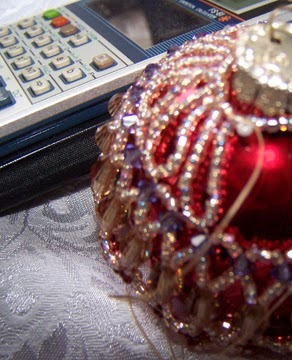 Now that the center piece of the ornament is complete you need to finish the rest of the ornament. 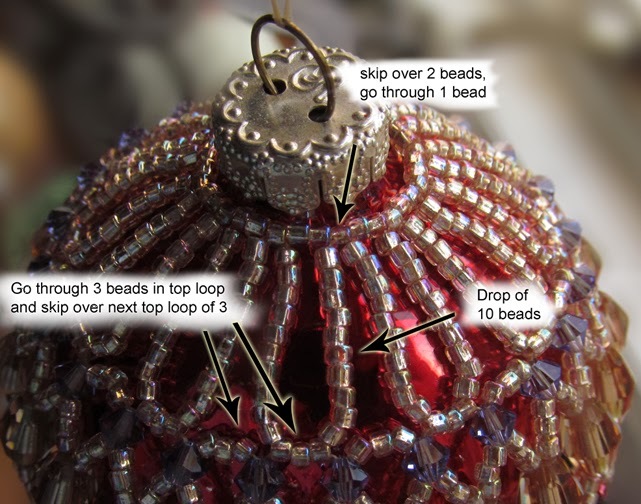 Put both the ring of beads and the necklace ring on the ornament to figure out how many beads are needed to join the top and the middle pieces together. These also don’t have to be all seed beads, You can mix in crystals and different color seed beads too. Because of the location of my necklace pattern ring, my attach beads are 10 beads. 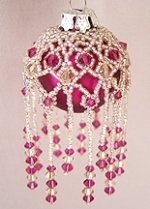 If you want beaded fringe around the bottom of your ornament you can add that too.